For over 9 years, AnythingIT in partnership with Fujitsu America, Inc have been partners in offering clients the highest possible return for trade-in as well as compliant e-waste recycling services. In extending Fujitsu’s commitment to both customers and the environment, this joint venture with AnythingIT has evolved into a foundation by which customers can now address the environmental concerns their legacy IT equipment poses. Through this FREE RECYCLING PROGRAM, customers can now have their legacy products recycled for *FREE *(minus shipping costs for all items other than laptops, tablets, & other mobile devices). In partnership with Canada Post (www.canadapost.ca), customers can now ship their legacy and outdated mobile products free of charge to AIT for environmentally compliant recycling. All other items such as Servers, Storage, Desktops, & Scanners will be received by AIT at a regional processing facility and there will be no cost for recycling upon receipt however customers are responsible for shipping costs. AIT can assist in the coordination of shipping services as needed by customers. Fill out the information for a Canada Post Pre-Printed Label to be sent to your email account within 2 business days. If you require a box, a flexipack and pre-printed label will be mailed to your house within 10 business days. 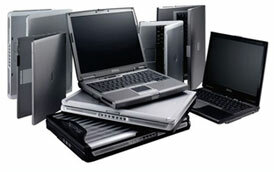 Give the packaged Laptop/Mobile Device to a Post Office Agent for shipping and environmental recycling. The Recycling is Free however shipping to our regional sites are not included. Please email Fujitsu@anythingit.com for instructions and in the subject line please reference FUJITSU FREE RECYCLE PROGRAM. Flexipacks are available for shipping at no charge. Request shipping label & packaging. I accept the Terms and Conditions and confirm that I am over the age of 18. Copyright ©2007-2009 Fujitsu America. All Rights Reserved. Fujitsu America offers award-winning LifeBook® notebooks, Stylistic® Tablet PCs, mobile computing accessories, PRIMEQUEST®, PRIMERGY®, and SPARC Enterprise™ servers, ETERNUS® storage products, InterStage® software, and a wide range of IT infrastructure solutions and services.